After you wash a load of dishes and go to put them away, do you find little hard water spots all over your glassware? Why does this happen? What can you do to make sure it doesn’t happen again? 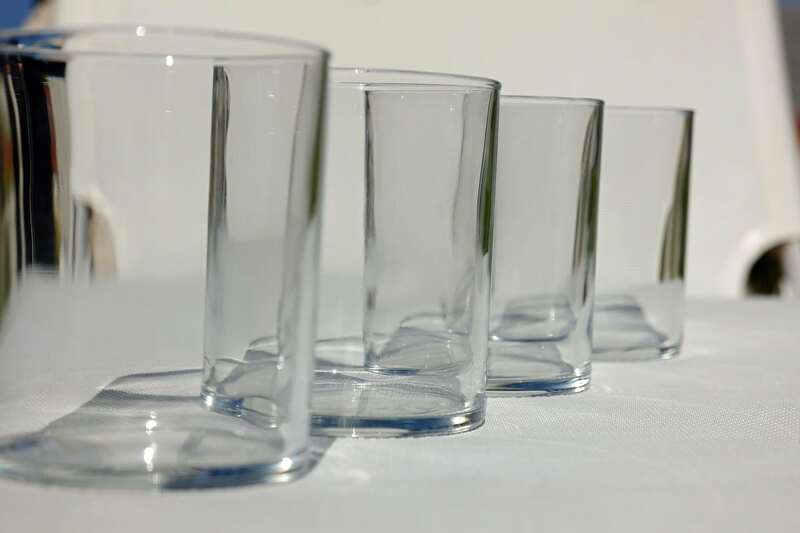 Advanced Water Protection will go over a few ways to eliminate hard water stains from your glassware (or any other glass that you clean around your home) and how to prevent the stains from appearing in the first place. What Exactly are Hard Water Stains? Hard water stains are the white, hazy spots that pop up on glass after you use water to clean it. This happens when there are too many minerals like calcium and magnesium in your water supply, known as “hard water.” You can learn more about the difference between hard and soft water here. These minerals can be difficult to remove from your water, making it tricky to get rid of those stains on your glassware, especially if you’re using the same hard water to try to remove them! There are several ways to rid your glass of hard water stains, both with liquid and without. You can try as many of these techniques as you need to until you find the one that works best for you. Mix salt and water. The salt will act as a scouring agent. Use a circular motion as you wipe the mixture on the glass. Once you have scrubbed the glass, use a clean, soft cloth to wipe off the saltwater, rinse the glass off completely, and wipe dry. Use a vinegar mixture. Vinegar is an acidic liquid. Make a mixture of 50/50 water and vinegar, and heat it up until it’s lukewarm. Put it in a spray bottle, spray the glass, and let it sit for 2 to 3 minutes. Wipe the cleaner off with a soft cloth after letting it sit, and your hard water stains should easily wipe away. Try a good dishwashing soap with lemon in it. The acidic quality in the lemon cleaner will help break down the calcium in the hard water and allow you to wipe away the hard water spots. Add a rinse agent to your dishwasher before you run it. There are many brands on the market. Fill up the part of your dishwasher that holds the rinse agent, and then run your dishwasher as normal. Use an acidic cleaner for the best results. Since hard water is created by mineral buildup, an acidic cleaner will get rid of the stains the best. Be aware that strong acidic cleaners are toxic. Be careful when using them, and make sure you're wearing gloves. Only resort to this method if you’re really having trouble getting rid of the stains on your glass. Make a paste with vinegar and baking soda. This paste should be rubbed onto the hard water spots on the glass and left to sit for a couple of minutes. Rinse the paste off completely and dry with a soft cloth. Use a black and white newspaper. The newsprint will reduce the minerals and make it easy to wipe way the water stains. You can use the newspaper dry, or soak it in water and then wipe the glass down. Try both ways to see if either work well for you. Follow up with a soft, dry cloth to make sure it’s completely dried. Yes, there's a right way to dry your glasses! It’s important that you use a cloth that's soft, clean, and lint-free. This will help reduce the risk of hard water spots staying on your glass and making them harder to remove later on. Dirty, rough cloth can mark up the glass or just scrape the hard water stains into streaks. As soon as you see any hard water spots on your glass, you want to clean it off as soon as possible. The longer you let it sit and the more you let it build up, the harder it will be to remove it efficiently. If you don’t want to make your own home cleaner, there are products out there that are made to clear up hard water spots. When the hard water spots keep returning and no amount of cleaning will keep them away (or you’re sick of the extra cleaning process), it may be time to take a look at the water flowing into your home. You may have a hard water problem that needs to be addressed before it harms your appliances and pipelines. Have AWS install a whole house water softener system that can help eliminate hard water for good!